The Ministry of Caring operates three child care centers, each of which responds to an acute need for affordable child care for offspring of the homeless and working poor. These include residents of Ministry emergency homeless shelters and additional residents of inner city neighborhoods. In these bright, lively places of learning and play, youngsters benefit from a quality education, nutritious meals, snacks and a stable environment, all crucial factors in the growth of body, mind and spirit. All three child care centers are Five Stars facilities through Delaware Stars for Early Success and accept Purchase of Care. Fully-certified professionals trained in early childhood education staff each state-of-the-art center. Dedicated caregivers, including Foster Grandparents, staff from Wilmington Senior Center and an army of volunteers, assist them. Each facility is designed and equipped exclusively for children of a specific age group. Operating hours meet the needs of working parents. The Child Care Center accepts children ages 6 weeks through kindergarten. Children learn and grow in an energetic environment. Il Bambino Infant Care Program serves children from six weeks to 12 months old. Compassionate, fully qualified professionals, along with volunteers, provide infants with quality care. Guardian Angel Child Care serves youngsters of working parents with low incomes. Children range from one year old through kindergarten age. All classes maintain a low child-to-staff ratio, with a teacher and teacher’s assistant in each classroom. 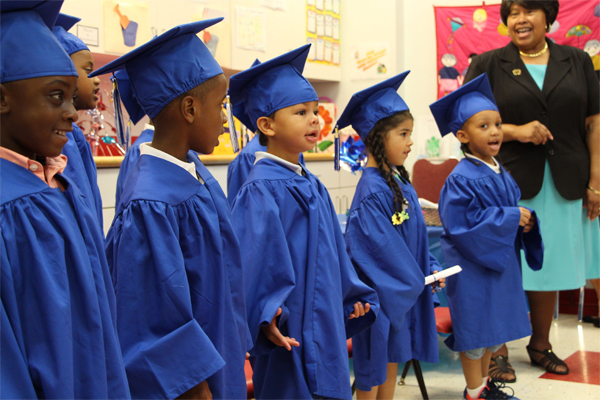 Laytina James, 4-year-olds teacher, and students from Guardian Angel Child Care, at 2015 graduation day. 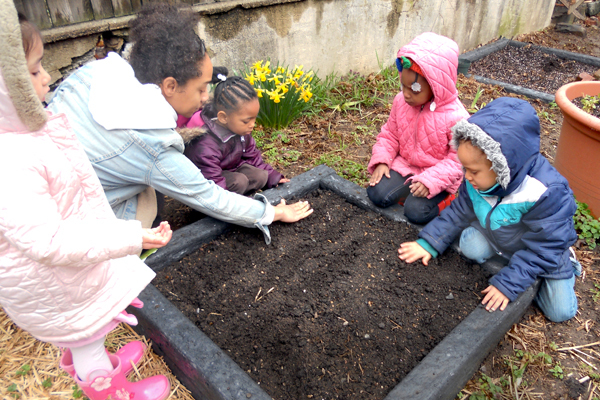 The Secret Garden is run by the Delaware Center for Horticulture and is used to teach kids at the Ministry’s child care centers about the environment and sustainability.